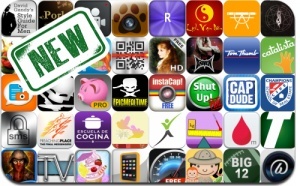 iOSnoops is constantly on the lookout for new apps, and here are 41 iPhone, iPad and iPod touch apps recently released. This new apps alert includes Epic Meal Time, Who’s Faster, Epic Meal Time, WoWiSat TV & Radio App, instaCap, Tom Thumb Stores, Impressionism, Salsa Driven Tutorial, Pinnacle Pet Portrait, Scout App, QR Code Simple, and many others. Thank You, Angels! – Doreen Virtue, Ph.D….